Escape to the seaside resort town of St. Andrews by-the-Sea in New Brunswick and enjoy scenic golf, relaxing spa treatments and quaint shops. 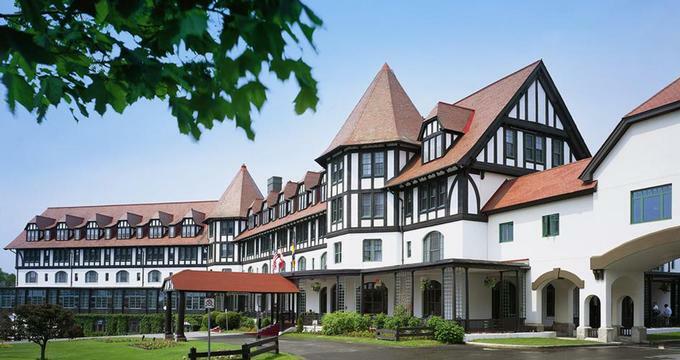 The historic Algonquin Resort, Autograph Collection in New Brunswick (formerly Fairmont Algonquin) is located in one Canada's best preserved 18th-century towns. The resort reopened in September 2013 following a $30 million renovation and is now part of the Marriott hotel group. Summers are pleasant with daytime temperatures in the 70s. The best way to get to know the area is by bike. There is also great hiking, golf and bird watching, so be sure to pack a small pair of binoculars for a closer view. Couples enjoy romantic sunset beach walks. Winter activities include snowshoeing, shopping and relaxing at the hotel spa. The Tudor-style hotel features a heated outdoor pool, squash & racquetball courts, tennis, shuffleboard and croquet. For kids, the hotel provides a playground with swings, monkey bars and slides. Children's activities are offered from July 1 through August 31, which makes the hotel a great place for a family summer holiday. Enjoy panoramic views of the picturesque Passamaquoddy Bay from many of the guest rooms and suites. Standard guest room amenities include 32" flatscreen TV's, free wireless access, and radiant floor heating in the bathrooms. The hotel spa offers a varied menu of treatments, from couples' massages to body scrubs and wraps. After the treatment, relax in the steam room. Choose from a variety of water sports, from sailing and boating to scuba diving. Visit the Fundy Discovery Aquarium with kids and learn about marine animals hands-on. Katy's Cove Beach & Playground is a popular spot for families also. Algonquin Golf Course was originally built in 1894 and is one of the oldest courses in North America. Enjoy scenic views and fresh ocean air on this unique course re-designed by by Thomas McBroom. The par-72, 18-hole course measures 6,908 yards. Facilities include a Clubhouse where you can stop for lunch and logo gear at the golf shop. If you want to practice some golf, there is a great driving range and Putting green. Kids can participate in the golf program for Juniors. Braxton's and the Club House Grill offer panoramic views of Passamaquoddy Bay, a great spot for lunch or drinks. Braxtons serves American cuisine and is open for breakfast, lunch and dinner. There is a cozy fireplace, perfect for relaxing with a cocktail. Nightly rates start at 151 CAD. Look for last minute and seasonal packages when booking your stay. Doubles start at $109 CAD per room, per night. The Saint John Airport is about 1.5 hours from the hotel, while the Fredericton Airport is 2 hours away. Car rentals are available at the airport.